Wonder what to do with that leftover eggnog? 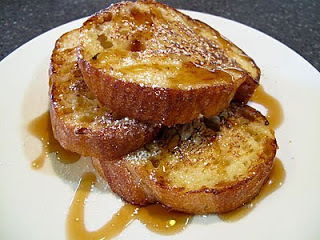 Here’s a french toast recipe that’s perfect for the holidays and throughout the year. Enjoy! Mix eggnog, milk and eggs. Heat griddle to 350 degrees and spread with butter. Dip each slice of bread in the eggnog mixture, allowing to soak for about 15 seconds. Turn and soak other side for about 15 seconds. Place on griddle and brown to a golden brown on each side, about 5-8 minutes per side.Remove to serving platter and sprinkle with powdered sugar. Serve with warm maple syrup.Serves 6-8This recipe, and 349 others can be found in our cookbook “Rocky Mountain Lodge & Cabins Favorite Recipes” which can be purchased in our Gift Shop. Click Here to order your copy.